The best way to develop your self awareness is by meditation. Although there is more to developing your self awareness then just by meditation. Meditation is a great starting point. People naturally step into self awareness as it is a part of evolution. There are some people who require understanding of what they are doing and then there are others who just do it as naturally as they just breath air. This blog is more for the people who would like more understanding about developing your self awareness. All people go through life as it is meant to be a class. We learn lessons wether we like it or not. We must face these lessons and deal with these lessons. As we face these lessons and learn to deal with them better and better, we will start to develop more awareness of self. Enhancing our survival in ways that will make life more fun and enjoyable instead of sabotaging our survival making life more hard and tougher on our selfs. As we are faced with challenges in life, no matter how hard they seem to be, we are giving the choice to look at it as it is or as we think it may be. Most the time these challenges aren’t bad nor are they good. They simply just are. Its up to our self awareness level to see the positive instead of creating it to be negative. You can almost look at this experience we call life as a spiral, we are either spiraling up or we are spiraling down. whats funny about this… is … its up to us and how we deal with the lessons that we must face as spiritual beings. The choice is ours and ours only. the more responsible we are for for our actions and our thoughts the more we will start to develop a higher degree of self awareness. 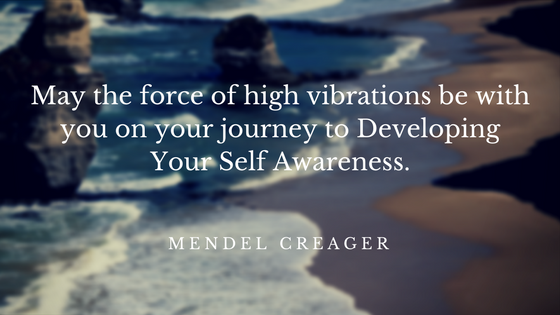 May the force of high vibrations be with you on your journey to Developing Your Self Awareness.